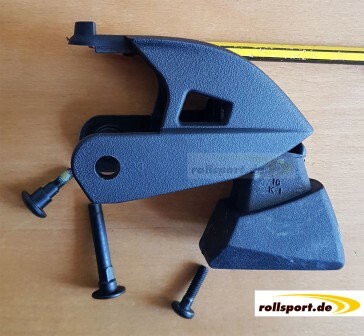 K2 brake system 23 Soul 5 - with brake rubber and mounting screws. It may happen that the brake frame breaks down or breaks due to a fall after quite some time. With us you can easily select the right brake system and install it at home in the inline skate. The number 23 is noted on the brake frame. The brake system consists of a brake frame, a brake stopper and the associated fixing screws. Is the K2 brake system 23 Soul 5 suitable for my K2 Skate? If a brake frame is still attached to the skate, please look at both sides of the brake system, because on one of the two sides a number must be engraved in the plastic. With this number you can find the right brake frame. If this number agrees with the brake frame, it will fit on your inline skate.